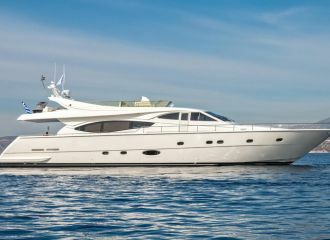 This Baglietto 120 yacht features enjoyable exterior decks with a choice of sunbathing, seating and dining areas. The recently refitted motor yacht boasts a spacious interior volume with a nice saloon and a separate dining area on the main deck. The yacht’s last refit has brought her to a great standard. This Baglietto 120 yacht can accommodate up to 10 guests in 5 cabins: 3 double and 2 convertible which can be set up either as a double or as a twin. Each convertible has an additional Pullman berth for an extra guest. 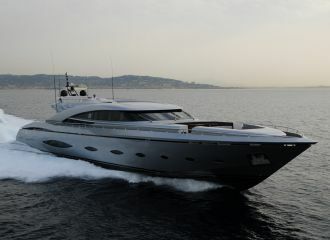 She is currently offered for charter in the Cyclades in Greece. total 12833	€ Excluding VAT and APA ?